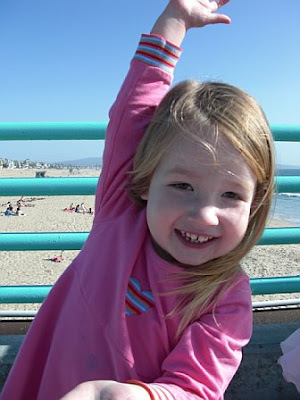 This is my middle niece, Missy's daughter, Lily. She will be 3 years old in May and everything is Princesses. This is my own design but I got a lot of ideas from surfing the web and using techniques introduced in books and blogs. The lettering was my first use of Tonya's alphabet tutorial. Thank you Tonya for your help. The wonky stars, hearts, crowns and framed princesses were inspired by Karla Alexander's Stack a New Deck and Freddy Moran and Gwen Marston's Collaborative Quilting. I enlarged my drawings to actual size and then paper pieced each horizontal section. The finished blocks were embellished with embroidery thread, trims and ribbon. I hope these hold up with use and washing. These cute noncommercial princesses came from the fabric I chose for the backing. I really didn't want to use any of the Disney Princesses even though they are popular, keeping the quilt more original and creative. Thanks to Jacquie's Spring to Finish Quilting I took the challenge and finished my T-shirt memory quilt and Lily's Princess. I'm still hand piecing my hexagons and getting close to joining the blocks in rows. April is over but the quilting goes on. Oh, Janet, that is absolutely darling - and I know the little princess loves it to pieces. She is adorable. 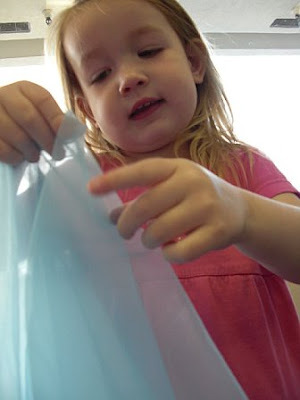 I miss having a little one to be around but certainly had great joy from my granddaughters when they were little - and still do now that they are grown! I keep hoping one day there will be a great grandchild - I would welcome boy or girl!! Your quilt is just precious and I can tell you had so much fun in making it. Ain't life grand? that turned out so cute!! i think the frog is still my favorite block. what a great quilt - you did a wonderful job. love the castle and the frog! 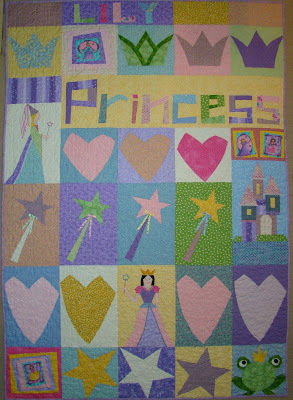 The perfect quilt for Princess Lily! Also, love your Sampler quilt. I have a granddaughter named Lily.....she is only nine months old but I think she will also have to have a Princess quilt in her future. Happy sewing, and loving up on Lily.